I love to travel and do it as often as I can. In fact, I’m ready to take off at a moment’s notice. Now that my kids are out of the house, it’s much easier. But travel can be challenging for people over 50, especially when you have to lug things through airports, train and bus stations. It’s a workout but so good for your body and soul. Below, I list the best Baby Boomer products, deals, and accessories that I’ve have found so far. My favorite place to travel is in Europe. I’m obsessed with it and there’s nothing better than a European river cruise. River cruise ships are smaller and more intimate than huge cruise ships. (although I love those too) It’s so fun to be dropped off for the day in quaint little towns so you can meet the people and experience their culture. Then, you’re back on board for dinner and a relaxing float down rivers strewn with castles and other beautiful sites. I also love traveling throughout the U.S., Mexico, Canada, the Caribbean, and just about anywhere. When I’m not out of town I enjoy promoting events and attractions in my hometown of Los Angeles. There are always so many exciting things to see and do. Please read this post: A Baby Boomer’s Guide to Travel Light and Nifty Over 50. Senior Discounts – (we may not like being called seniors, but the discounts are awesome! Affinity Groups, like, AAA, Senior’s Coalition, AARP, Veterans Organizations, Alumni Groups, etc. offer tremendous saving opportunities for seniors. People traveling as a member of an affinity group enjoy terrific discounts. So, if you’re not part of any affinity group, think about joining one. Do you want to avoid standing in line to get checked in? Even TSA-Pre can take some time. Now all you have to do is go to the CLEAR kiosk at the airport and look into the screen. It will CLEAR you immediately and you’re ready to go. CLEAR uses biometrics like your eyes and fingertips, instead of traditional ID documents, to get you through security faster at airports and stadiums. All you have to do is become a member. Agoda.com is excellent for booking hotels, flights, rental homes, and car rentals, especially in South East Asia. It’s based in Singapore. If you’re traveling to an Asian destination, you can’t beat it for best hotel deals and vacation rentals. You can also find great prices for travel in Europe, Australia, and the Middle East. Booking.com – The premier site for booking everything from flights, hotels, car rentals, vacation rentals, restaurants and more. They service over 1,000,000 properties all over the world. Expedia – This site does it all and is a popular site for affordable flights, hotels, cars, vacation rentals, cruises, bundle deals and more – It’s one of the most trusted search engines for bookings. Expedia subsidiaries: Expedia owns several other booking aggregators. They all offer similar services and you will probably find almost the same prices for flights, hotels, etc. It’s always good to check, though, as they sometimes feature their own special deals. Hotwire – You can save up to 60% when you book 4-star-PLUS hotels using Hotwire all over the world. It’s also a good site to book flights, cars, and to create your own vacation packages. Travelocity! – Home of the travel gnome. The Amazing Race uses Travelocity to book trips for its contestants all over the world. Find flights, hotel rooms, cruises, car rentals and activities at competitive rates. Orbitz – You can earn Orbucks on flights, hotels and more. Trip Advisor – Before you go anywhere visit Trip Advisor to find reader reviews on hotels, restaurants, and activities. I never go anywhere without consulting it. And now, you can also book hotel reservations. You’ll find amazing ideas and tips for activities, restaurants, tours, and more all over the world. These search engine sites focus on airline bookings including last minute flights. Why spend more for an airline ticket than you need to? Save money to enjoy your travel experience instead. You may want to give several of these a try to find the best rates. CheapOair – This is an independently owned company. They are more competitive for international flights rather than domestic and you can find great deals. They also offer hotels, cars, cruises and vacation packages. Cheap Air – This company was founded in 1989, Its search engine finds 100 times more low fare flights that other booking sites may miss. They specialize exclusively on flights. Momondo-US – Find and compare cheap flights. It’s free to search on Momondo and they check the prices from thousands of travel providers and also compare the prices to other travel booking sites. It’s not a booking site but is a metasearch engine whose function is to return airfare data without steering you toward one set of results over another. Highly rated by many full-time travelers. Skyscanner – This site uses a unique search engine technology that connects to hundreds of travel sites directly. It is not reliant on third parties. They go directly to the airline, hotel, or car rental site giving you the lowest prices out there. They also have a free and easy to use phone app. Jet Radar – will help you find the cheapest deals on flights, hotels, cars, and buses. It aggregates rates from Priceline, Skyscanner, Momondo, JetCost, Orbitz, and Travelocity. Cruising is one of the easiest and most luxurious ways to travel especially for people over 50. It’s like a floating hotel that takes you from destination to destination. I’m a huge fan of river cruises but ocean liners are amazing too. Cruise Direct – Cruise Direct has some of the best discounts on cruises all over the world. Cruise lines include Carnival, Celebrity, Costa Cruises, Cunard, Disney, Holland America, MSC, Norwegian, Princess, and Royal Caribbean. You can even book last minute cruises at the best prices. MSC Cruises – Book your cruise on their website and find an incredible deal ! – MSC offers all the quality and comfort of a 5-star hotel, and much more, offering great cruise deals. Points.com – It gets frustrating when you join a bunch of programs to earn travel points and then have to keep track of each one. Points.com make it possible for you to have one place and one password for all your programs. Your points are automatically updated and can be viewed on one dashboard. Trade and exchange your points or buy and gift miles. Hilton Hotels, which include Waldorf Astoria, Conrad, Canopy, Curio, Doubletree, Tapestry Collection, Embassy Suites, Hampton Inn, tru, Homewood Suites, and Home 2 always offer outstanding rooms and service all over the world. You can join Hilton Honors and earn points for future visits. If you are an AARP member you’ll receive a 10% discount. Hotels.com – Simply the best for affordable Deals! They will help you find excellent hotels around the world and flight-hotel bundles. Home Away – Not into staying at a fancy hotel? Rent a home or rent your own home out as a vacation rental. Home Away has properties all over the world. All you have to do is enter where you want to go, your arrival and departure dates, and their website will bring up rentals in big cities, in the country, by the lake, or any environment you desire. Best Western Hotels – I’ve always had good luck with Best Western Hotels and have stayed in them many times. Their rooms are affordable, for those on a budget and well-kept. Best Western offers Senior Discounts so make sure to ask when you book your reservation. Wyndham Hotels and Resorts – You can find Wyndham Hotels and Resorts throughout the world and earn Wyndham Rewards each time you stay there. Don’t forget to ask for your 10% Senior Discount through AARP or AAA. Motel 6 – Motel 6 also offers Senior Discounts. It’s known for its “no-frills” affordable rooms if you’re on a budget and don’t want to spend all your cash on hotels along the way. You may want to check reviews before booking as some are better than others. Radisson – Radisson hotels are available worldwide and are known for their outstanding service and properties. If you join their Club Carlson, you can earn points to stay at Radisson Blu, Radisson®, Park Plaza®, Park Inn by Radisson and Country Inns & Suites By CarlsonSM. Extended Stay America – With over 625 hotels across the U.S., Extended Stay America offers affordable suites that don’t feel cramped as well as fully-equipped kitchens, Free GRAB-and-go breakfast, on-site laundry, and other amenities. It’s perfect if you are staying for a long period of time as they have weekly, biweekly, and monthly rates. Groupon Getaways – Want a quick getaway that is affordable and fun? Make sure to check with Groupon Getaways you may find the perfect weekend trip or amazing vacation package deal. Living Social Vacation and Flight Packages – Find some great deals on vacations and flights by checking on Living Social. You may find something you weren’t expecting. Sandals and Beaches Resorts – Enjoy luxury inclusive vacations in the Caribbean where you never have to worry about tipping, where to eat, or what beach to go to. It’s all there. Great for weddings, romantic holidays, and even for the entire family. VRBO – VRBO is a part of the HomeAway family, the world’s leading online marketplace for the vacation rental industry with sites representing over 1 million paid listings of vacation rentals in 190 countries. HomeAway is a part of the Expedia, Inc. family of brands. Through VRBO, owners and property managers offer an extensive selection of vacation homes that provide travelers with memorable experiences and benefits, including more room to relax and added privacy, for less than the cost of traditional hotel accommodation. Restaurants.com – This site serves 62,000 restaurants and providers all over the United States. Find discounts, deals, and coupons for your favorite dining spots or give someone the gift of a night out on the town. Groupon – You can always find great deals on local restaurants at Groupon as well as culinary events, and other great stuff. Rail Europe – The best way to travel through Europe is on a train. It makes life so easy and you can really see the country as you travel! If you book a high-speed train it will take you where you want to go in much less time and it’s so comfortable. Sixt Car Rentals – We used Sixt when we drove through Italy and everything ran smoothly. It’s affordable and reliable with wonderful customer service. Hertz Rental Cars – A well-established rental car service. I booked a Hertz car to visit Pala Casino from Los Angeles and it was easy peasy. I had unlimited mileage and used my AAA discount. It was affordable and I loved my car. Auto Europe – This site offers the best auto rates in Europe. It’s been around for 60-years and has partnerships with all the most reputable car rental companies. If you find a lower car rate, they will lower their rates to beat the price. They also have a 24/7 service hotline – available from pick-up to drop-off and over 20,000 convenient pickup/dropoff locations throughout Europe. Expert Flyer – Find Flight Availability, Flight and seat upgrades & awards, frequent flyer Information and more! Big Bus Tour – I LOVE LOVE LOVE the Big Bus Tour we took in London. It’s the best way to get around the city. And what’s cool is that there are Big Buses throughout the U.S. and the world. Their Hop on Hop off buses are guided tours (sometimes live) that highlight points of interest but are entertaining and informative as well. I’m also excited to announce they are now in Los Angeles. GoCollette – This highly-respected guided tour company has been booking exciting trips all over the world for 100 years. You will save time and money and have all the details taken care of for you with their stellar and personalized guided tours. Their focus is on getting the best prices for the most satisfying travel experience. Use my “BOOMSTERSAVE” coupon code for up to $600 in savings. Viator – Tours, sightseeing tours, activities, and special events. This company is affiliated with TripAdvisor and is based on best reviews with over 60,000 things to do. It’s vetted by personal experiences. Search by destination, popular attractions, and tours. It’s a wonderful way to find the best deals and ensure your vacation will be fun and exciting. Tours4Fun – Nothing makes a trip more exciting than a wonderful tour. Tours4Fun offers packaged tours as well as day trips all over the world. They include bus and coach, train, bicycle, boat, and walking tours as well as special activities, events, and day passes. Rather than take your chances with a local tour operator, you can put your whole trip together on one site. Stride Travel – This company designs tour specifically for Baby Boomers. You can book tours throughout the world without using a middleman directly with the operator. You’ll find everything from a relaxing river cruise to an African Safari at affordable prices. And just because Stride Travel is focused on Baby Boomers doesn’t mean they offer rocking chair tours. Some of their popular destinations include Myanmar, Machu Picchu, Tanzania, Cuba, and the Galapagos Islands. Sightseeing Pass – Sightseeing Passes are an exciting and efficient way to visit new cities while saving visitors a lot of money. They include free entry to many of the city’s best attractions, hop-on, hop-off bus tours, cruises and often provide visitors with exclusive dining options. 365 Tickets – This site sells e-tickets to more than 2000 Visitor Attractions and Theme Parks worldwide. It’s built on the latest technology and sells directly with no middleman. You will find money-saving packages to your favorite fun things to do. Tours by Locals – Find private and customized tours by locals who live in the area. This company has 3468 Guides in 156 Countries all over the world. You can also use local guides as a more personal alternative to cruise line shore excursions. All you have to do is enter your cruise line, ship and, date to hook up with a guide the moment your ship arrives at a port. AXA Travel Insurance – One factor that’s important to take into consideration when purchasing travel insurance as a Baby Boomer is the availability of a Pre-Existing condition waiver. AXA offers one for all of its members up to the age of 100 years old. However, members must purchase a policy with AXA within 14 days of making their first booking in order to qualify for it. Their prices are competitive and they offer the same benefits for people age 0 – 100. You can set up direct billing with hospitals abroad and they have a medical team on staff 24/7. Travelex Travel Insurance – This company provides travel and trip insurance. Travelex makes it their priority to ensure you have the best vacation possible. Children under 21 are insured at no additional cost and they provide coverage for emergency medical evacuations. Other products include expedited passport services and international driving permits. Travel Guard Insurance – Get coverage for unexpected medical expenses while on a trip. They will also help you track your luggage through Bag Trak®. Trip cancellation coverage is standard and there is coverage available for preexisting conditions. Take advantage of the My Travel Guard feature which lets you build your own plan, specifically for your individual needs. It’s considered to be one of the best travel insurance companies for seniors. Check out their Pre-Existing Medical Condition Exclusion Waiver – With the waiver, it’s possible to be covered for some medical issues on your trip, despite your pre-existing condition. World Nomad’s Travel Insurance – Recommended by top travel bloggers. Chester – Carry-on luggage made with some of the strongest and sleekest materials you can find. If you’re looking for an awesome carry-on bag take a look at the Minima Carry-on21.5″ x 13.5″ by 8.5.” TSA and cabin approved with silent 360 multi-directional wheels and an Aerospace-grade polycarbonate hard shell. 7lbs. Ebags – Find a wide array of top brand luggage, purses, travel supplies, and backpacks at affordable prices. They have a huge selection of travel-related products at the best prices I’ve found. Zappos Travel Page – This is new! Zappos now has a page dedicated to travel-friendly clothing, shoes, accessories and more. Shoes are an important part of travel comfort and you can find just about every brand you can think of at Zappos. Check out my Amazon Recommendations – I’ve added travel gear as well as other favorite products that I personally use and enjoy! 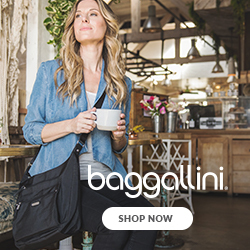 baggallini – RFID protected handbags, backpacks, laptop bags, rolling bags, and accessories. I LOVE their bags. They’re sturdy, easy to wash, and functional for all your travel needs. Lonely Planet – For the ultimate in guidebooks, coffee table books, eBooks, maps, phrasebooks, maps, magazines and how-to’s visit Lonely Planet. You will find over 500 inspirational and trusted books as well as award-winning digital products. For more travel tips, recommendations, and posts click here.